Last week’s Cycle 2009 at Earls Court saw the launch of 2 brand new TORQ products. TORQ’s new bar has been a long time coming and this new taste sensation is aimed at the Organic purist, or quite frankly anyone else who can’t resist its draw. 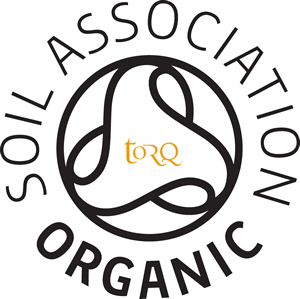 This organic bar is certified by the Soil Association and maintains the same texture and mouthfeel demonstrated by all of TORQ’s other bars. Carbohyrdate: They ‘need’ carbohydrate full stop. They ‘need’ it whilst they exercise to spare their limited glycogen reserves and at rest to top their valuable stores back up again. TORQ bar contains over 70 grams of carbohydrate per 100g (in excess of 40 grams per bar). Glycaemic Index: They ‘need’ a food with ingredients wide-ranging in glycaemic index for immediate and sustained release of glucose into the bloodstream. TORQ bar has been carefully formulated to include ingredients with low, moderate and high glycaemic indices for this purpose. Ultra low fat: They ‘need’ a food that is ultra low in fat to guarantee rapid digestion and minimize the intake of ineffective calories. 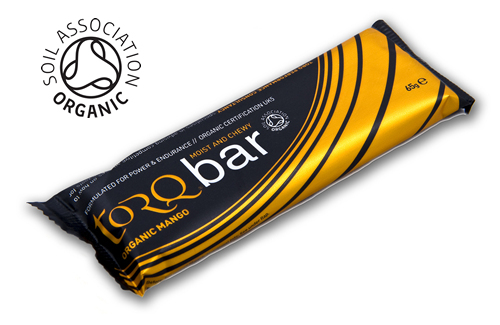 TORQ bar contains only 2 grams of fat per 100g (just over a gram per bar). Easy to eat: They ‘need’ a food that is easy to eat, or they won’t eat enough of it to derive the benefits. There are too many dry energy bars out there, making it difficult to supply sufficient carbohydrate calories – the ones that aren’t dry tend to contain too much fat. TORQ bar is delightfully moist and chewy, yet it remains ultra low in fat and high in carbohydrate. Following the huge success of TORQ gel’s launch at the Cycle Show in 2007, we are now launching a new flavour, Banoffee (with Guarana). Until now, TORQ have only had one naturally caffeinated gel option (Forest Fruits), so we knew we had to formulate another one. 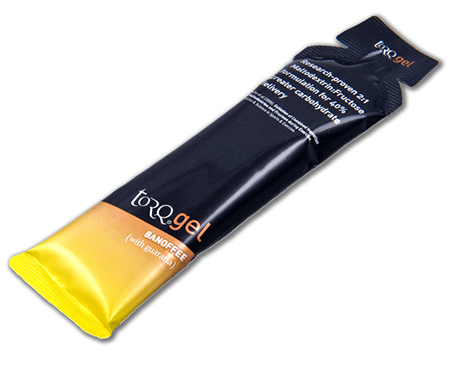 Think creamy buttery caramel with a hint of banana and that’s the flavour hit you’re going to get with this new gel. It also contains a whopping 89mg dose of natural caffeine though (delivered through Guarana), so it packs an extra punch too. Research-proven 2:1 Maltodextrin:Fructose formulation for 40% greater carbohydrate delivery. Wallis et al (2005). Oxidation of Combined Ingestion of Maltodextrins and Fructose during Exercise. Medicine & Science in Sports & Exercise. Maltodextrin used in isolation has been proven to be considerably more effective than glucose used in isolation because of its lower osmolality in the gut. However, the research stated above compared traditional ‘maltodextrin only’ formulations with a 2:1 Maltodextrin:Fructose blend and the results are nothing short of staggering. Maltodextrin is the best carbohydrate to use in isolation, but what happens if you mix Maltodextrin with Fructose? Basically, unlike Maltodextrin and Glucose, which compete with each other for absorption, Maltodextrin and Fructose are absorbed in parallel, so you get the ultra-fast energy supply from Maltodextrin, plus the slower energy release from Fructose. In total, there’s a 40% greater delivery of carbohydrate to the working muscle. The peer-reviewed research study stated above is one of many recent pieces of research that have demonstrated these findings and ‘peer reviewed’ means that the results have been published in a reputable scientific journal. Be wary of claims by manufacturers that cite ‘University Studies’ without referencing a mainstream publication. These new TORQ products are now available to purchase online, so click HERE to visit our online shop. For the time being, these products are not incorporated into mixed boxes, but give us a few weeks and we’ll get some variety options online.